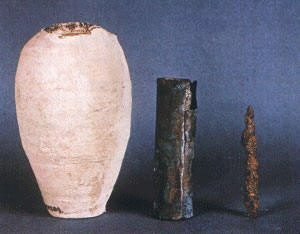 The Baghdad Battery, sometimes referred to as the Parthian Battery, is the common name for a number of artifacts created in Mesopotamia, in during the Iranian dynasties of Parthian or Sassanid period (the early centuries AD), and probably discovered in 1936 in the village of Khuyut Rabbou’a, near Baghdad, Iraq. These artifacts came to wider attention in 1938 when Wilhelm König, the German director of the National Museum of Iraq, found the objects in the museum’s collections. In 1940, König published a paper speculating that they may have been galvanic cells, perhaps used for electroplating gold onto silver objects.This interpretation continues to be considered as at least a hypothetical possibility. If correct, the artifacts would predate Alessandro Volta‘s 1800 invention of the electrochemical cell by more than a millennium. Description and datingThe artifacts consist of terracotta jars approximately 130 mm (5 in) tall (with a one and a half inch mouth) containing a copper cylinder made of a rolled-up copper sheet, which houses a single iron rod. At the top, the iron rod is isolated from the copper by bitumen plugs or stoppers, and both rod and cylinder fit snugly inside the opening of the jar, which bulges outward towards the middle. The copper cylinder is not watertight, so if the jar was filled with a liquid containing citric acid, this would surround the iron rod as well. The artifact had been exposed to the weather and had suffered corrosion, although mild given the presence of an electrochemical couple. This has led some scholars to believe lemon juice, grape juice, or vinegar was used as an acidic electrolyte solution to generate an electric current from the difference between the electrochemical potentials of the copper and iron electrodes. König thought the objects might date to the Parthian period (between 250 BC and AD 224). However, according to Dr St John Simpson of the Near Eastern department of the British Museum, their original excavation and context were not well recorded (see stratigraphy), so evidence for this date range is very weak. Furthermore, the style of the pottery (see typology) is Sassanid (224-640). Most of the components of the objects are not particularly amenable to advanced dating methods. The ceramic pots could be analysed by thermoluminescence dating, but this has apparently not yet been done; in any case, it would only date the firing of the pots, which is not necessarily the same as when the complete artifact was assembled. Another possibility would be ion diffusion analysis, which could indicate how long the objects were buried.Electrical Copper and iron form an electrochemical couple, so that in the presence of any electrolyte, an electric potential (voltage) will be produced. König had observed a number of very fine silver objects from ancient Iraq which were plated with very thin layers of gold, and speculated that they were electroplated using batteries with these being the cells. 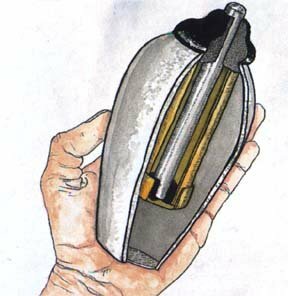 After the Second World War, Willard Gray demonstrated current production by a reconstruction of the inferred battery design when filled with grape juice. W. Jansen experimented with benzoquinone (some beetles produce quinones) and vinegar in a cell and got satisfactory performance. The gilded objects which König thought might be electroplated are now believed to have been fire-gilded (with mercury). Reproduction experiments of electroplating by Dr Arne Eggebrecht consumed “many” reproduction cells to achieve a plated layer just one micrometre thick. Other scientists noted that Dr Eggebrecht used a more efficient, modern electrolyte; using only vinegar, the battery is very feeble. An alternative, but still electrical explanation was offered by Paul Keyser. It was suggested that a priest or healer, using an iron spatula to compound a vinegar based potion in a copper vessel, may have felt an electrical tingle, and used the phenomenon either for electro-acupuncture, or to amaze supplicants by electrifying a metal statue. However, this is dubious, since a “tingle” requires a far higher voltage than can be generated by an iron/copper cell. READ 2014: Who Gets Thrown Under The Bus In The Next Financial Crisis?